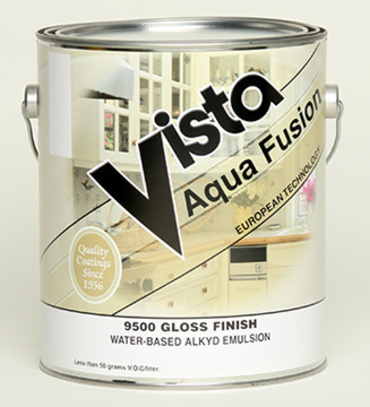 Aqua Fusion is a premium plus waterborne interior alkyd emulsion enamel with superior gloss, brush-ability and spray-ability achieved by using breakthrough technology in coating chemistry. This is an environmentally preferable product with low odor and low VOC. The application characteristics are equal to or better than â€œold alkyd enamelâ€ with an alkyd-like hardness, print resistance and better yellowing resistance than conventional alkyd products. Cleans up with water instead of solvent. Recommended Uses: For use on interior drywall, concrete, wood and primed metal surfaces that require hard and glossy enamel. This product can also be used for exterior doors and frames. Colors: White and special order factory tint.